I am proud of Ben Affleck. It's like he was taken seriously when he and pal Matt Damon won the Oscar for Best Original Screenplay for "Good Will Hunting" back in 1997, then had a period for awhile where critics could not see him in a serious light with films like "Daredevil" and "Surviving Christmas", but his last few major projects have shown just how far Affleck has come. He has given some of the best performances of his career in films such as "Hollywoodland" (which is actually one of my personal favourite films) and "State Of Play", and had an extremely successful full length directorial debut in the 2007 film, "Gone Baby Gone". In "The Town", he shows his true talent as a director and an actor. It is great to look at someone like Ben Affleck and see true potential being reached. Being an Affleck fan for a long time, I left the cinema bursting with pride for him. Nothing like a film to prove what you knew all along! I have often spoken about how films can be a great tourism tool, but this film actually got me thinking about how they can sometimes not be such great tourism tools. Boston is a beautiful city, and I know I'm not the only one who thinks this. "The Town" does actually show some of the beauty of Boston, but it shows the bad side of the city as well. It represents Boston in a dangerous light showing the crime and poverty. There is nothing wrong with what Affleck has done here, as he is madly in love with Boston and I am sure he would love people to visit it, but there are people who haven't been to Boston and know nothing of it besides what they see in the film. These people probably wouldn't want to visit Boston after seeing this film. Shame if they are going to base their opinion of all of Boston on a film that focuses only on Charlestown, which is only one part of Boston. 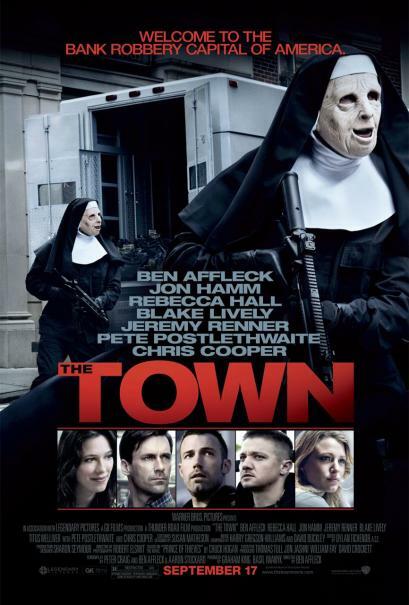 Review"The Town" is one of those truly unpredictable films. There is nothing worse than sitting through a movie with a clear idea of where it is heading and how it will end. With its unpredictability, fine acting and brilliant cinematography, Ben Affleck proves himself as a successful director, if there was any doubt before. Doug MacRay (Affleck) is living in a world plagued with crime and theft which he is trying to escape, but keeps finding himself drawn back into the lifestyle of Charlestown that he and is friends have grown up in. When they rob a Boston bank and take hostage the bank's manager, Claire (Rebecca Hall), Doug feels that he should follow Claire to make sure she doesn't do or say anything that will get them caught out. However, the two start falling for each other, which means that Doug must do all he can to keep who he really is hidden. Being from Charlestown, escaping who the world he has grown up in impacts every aspect of his past, present and more than likely his future. "The Town" is extremely well done. The story is well written and is perfectly adapted for the screen. It is extremely clever and interesting from the beginning to the end. Although it can be slow in parts, every scene is meaningful and is there for a reason. The cinematography is definately a stand out. It is extremely impressive and often beautiful, as well as being completely appropriate for each instance. "The Town" is very well pieced together with the range of camera shots, sound and locations that help explore the emotion and reality of the film. Perhaps one of the strongest points of "The Town" is its character development and it's cast. By the middle of the film, it is as though the audience knows each of the main characters personally and is able to empathize which each one of them. Affleck gives a stellar performance as Doug. The audience feels each of his emotions that he passes through and see's that he is desperate to escape the way of life in Charlestown. At times he does come across as perhaps too nice of a guy that you have to wonder how such a nice guy can even contemplate being involved in the type of activities he is.It is as though he doesn't have a reason to commit theft, he just does it for the sake of it. However, this is the way Affleck shows how Charlestown can make people do things that they wouldn't be exposed to anywhere else. Jeremy Renner is perfect as Doug's partner in crime and long time friend, Jem. He has the right amount of aggressiveness and intensity to make the audience believe that a person like this could really do the unspeakable. Rebecca Hall also gives a great performance and perhaps the best performance of her career to date. She is extremely likable and can light up the room with her smile, yet when she is upset or angry, it ignites fear. Blake Lively does well as Doug's ex love interest, Krista, although she does not come across as quite as trashy as the film makes her out to be. "The Town" is complete success and it brings out the best in everyone involved. The acting is superb, story thrilling and direction a tribute to Affleck. He has really shown what he is capable of with both his direction and acting in this film. Well done. Did you at all feel like this was a copy or a ripoff or too similar to The Departed? Just curious. It reminded me of it the way it was filmed and that it was set in Boston, but the stories were completely different.